Monday night will mark the Season 2 premiere of The Millers, featuring Billy Eichner, one of pop culture's best yellers. Don't know who that is? How dare you! Now stop everything so that I can explain. Billy Eichner is a New York based comedian and professional pop culture enthusiast. It's also important and amazing to note that he has recently become the subject of his own celebrity controversy with Burger King. How exciting! But what Billy Eichner is known best for is his ambush game show Billy On the Street. It's an often inappropriate entertainment trivia show that tends to become more about his opinions on anything from Drew Barrymore to the underrated Pixar film Ratatouille . He takes on the faux persona of a host/news correspondent, approaching people at random and asking them questions. The show airs online on Funny or Die and on cable network Fuse, however Eichner was putting his videos on YouTube years before they were picked up by either outlet. In an interview with Seth Meyers on Late Night , Eichner revealed that he later discovered that comedy greats like Amy Poehler, Rachel Dratch, and Paul Rudd had been big fans and were showing the videos to their friends. You never know who's watching! Or reading... Oh God. Anyway, it's time to come down this rabbit hole with me. Honestly, I could share Billy Eichner videos all day. However, in the spirit of the games I'm not giving you his "best" Billy on the Street moments, I'm going to be subjective and give you my favorites. Billy would be so proud. If there's one thing you need to know Billy Eichner's pop culture preferences, it's that he loves Meryl Streep. So much so that he set up a whole obstacle course competition in honor of her. He's also been putting stickers of her face all over NYC and asking fans to tweet them at him using #IFoundMeryl. Do you think he can tell the Gummer girls apart? It's not easy! Besides passersby, the comedian also enlists celebrities to play games or do bits with him. Here is the classic "It's Spock, do you care?" He's had Rashida Jones, Olivia Wilde, Paul Rudd, Patton Oswalt, Debra Messing, Neil Patrick Harris, and even more on the show as well. I know it's still October, but here are two of the sunniest people on Earth singing Christmas Carols with strangers. If that doesn't brighten your day, I probably don't want to know you. When your job involves running up to strangers in New York City, you are sure to meet some characters. That's a pretty obvious occupational hazard. However, Eichner struck a real gem with Elena. Her ornery appearance on the segment "Quizzed in the Face" became a cult sensation and Eichner has managed to track her down and have her return to the show multiple times since. Elena is also the only person I've ever seen make him break "character" on the show as well. Which is saying something, as he once asked a tiny child questions about Weekend at Bernie's and Django Unchained. Have you heard? Hotmail picked up 12 new episodes of Judging Amy! Fans of Emmy snubs and Billy on the Street got a treat at this year's awards show, hosted by Seth Meyers. They did a segment in the style of a "Lightning Round" from the show, asking questions and taking donations for the cast of The Big Bang Theory. Every little bit counts! If by some tragedy you still don't know who he is, or you recognize his face but have never seen his show before, I can maybe help you out. Here is a lovely interview that Billy Eichner did with the late Joan Rivers. He also wrote a tribute to the comedienne. 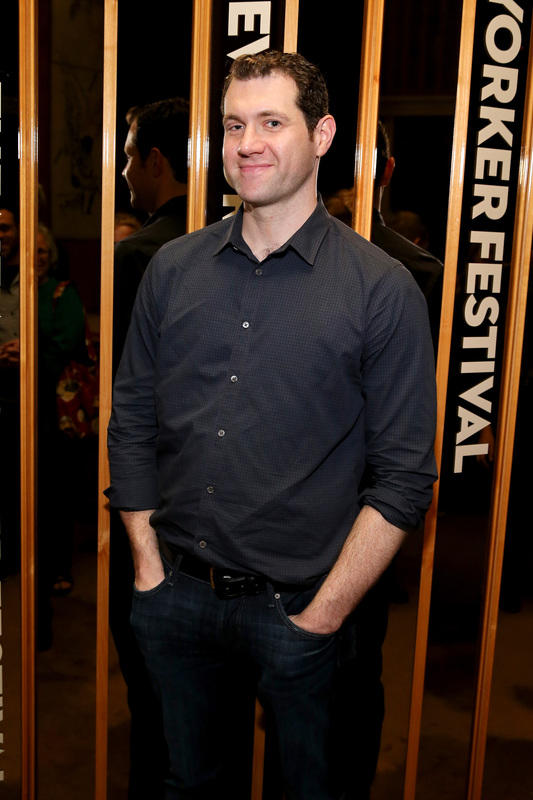 In addition to this upcoming guest stint on The Millers and soon to be on New Girl , Eichner recurs as the caring Craig Middlebrooks on Parks and Recreation and lent his recognizable voice to Bob's Burgers . He has also appeared on Watch What Happens Live, Conan, and one of my new obsessions, Hollywood Game Night. You absolutely have to watch his spoof Taylor Swift video,"Glitter and Ribs." Finally, Billy Eichner is one of my favorite tweeters. He should be, because he understands the power of Twitter. If all of this hasn't turned you into Eichner's biggest fan, hopefully his guest appearance on The Millers will.